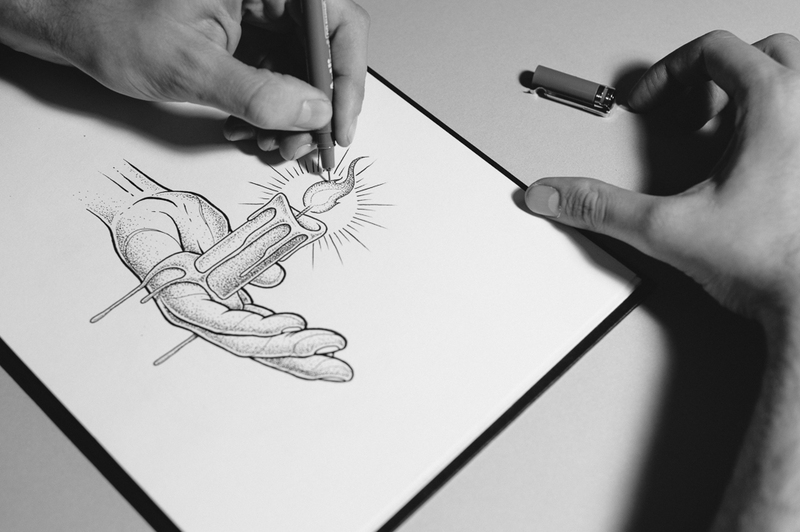 Eltipo is a graphic designer with skills ranging from typography to illustration. His work always originates from hand drawn images, letters and layouts. We asked this talented guy our 10 questions. I’m a graphic designer who spends most of his time at work behind a computer. After working hours (if there is any difference between working & playing), I find it relaxing to go back to basics and draw on paper. Doing this, I have the opportunity to really do my own thing, which is difficult in a world where you design for commercial brands. I do a lot of dot-shading, a technique which you can compare with pointillism. You control your color tones and shadings simply by using more or less dots. 2. At what time do you start your day and what do you do first? At 8 o’clock and then I hit snooze at least 3 times! I always wanted to be creative, to do things with my hands, I don’t know why. Maybe because of my dad who was always working on cars and creating things in his garage. Finding the right words to describe why you love doing what you do, is difficult. Defining where the passion for this kind of work comes from is hard to do. Can I simply say typography? 6. Do you think you’ll keep walking down this path in the future or do you have other creative calls? Always up for a challenge, but I’ll just take it as it comes. I don’t consider it to be a masterpiece, but if I have to give you one work it will be “A cat’s brain”, a work I did for my first exposition. Not because it took me 5 days to finalize it, but because it has a deeper meaning to me. 2014, because your own identity will always be the same. Simply rum or beer will do.